The uptime of your enterprise email and productivity apps is critical to keep business running as usual. However, managing, monitoring, and patching these collaboration apps can be time-consuming and complex. So, how can you optimize all of the performance of these applications in an efficient way? This concise white paper offers a snapshot into a managed private cloud environment that can help ensure your mission-critical Microsoft applications run effectively. 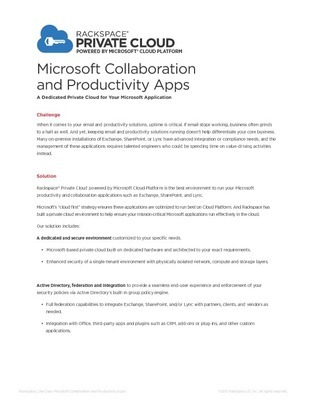 Download now to learn how you can power Exchange, SharePoint, Lync, and more with higher availability.